Afrocarpus gracilior first described by Robert Knud Friedrich Pilger (1876–1953) and finalized in 1989 by C.N. Page, in New and maintained genera in the conifer families Podocarpaceae and Pinaceae; Notes of the Royal Botanical Garden Edinburgh vol. 45 no. 2. It is commonly known as African fern pine. Description. African fern pine is a medium-sized evergreen coniferous species of tree, which will grow to mature heights of 65 to 130 feet (20 – 40 m) tall, rarely to 150 feet (50 m), with a trunk 20 to 32 inches (50 – 80 cm) in diameter at breast height. Bark is smooth at first, later becoming platy and flaky in larger trees. Branchlets are more or less quadrangular within dense foliar units. 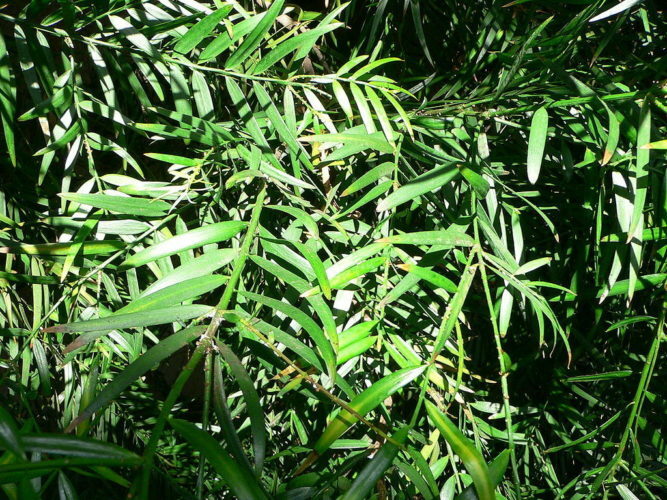 The gray-green leaves are spirally arranged, lanceolate in shape, 0.8 to 2.4 inches (2 – 6 cm) long and 0.12 to 0.2 inch (3 – 5 mm) broad on mature trees, and larger, to 4 inches (10 cm) long and 0.24 inch (6 mm) broad on vigorous young trees. 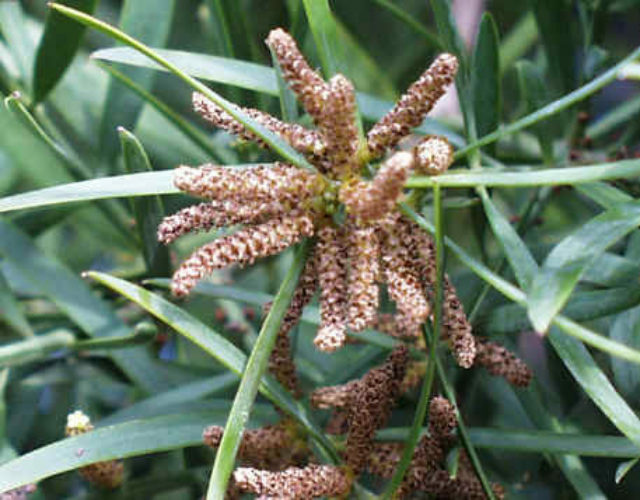 The pollen cones are solitary or in clusters of two or three on a short stem. The seed cones are highly modified, with a single 0.8 inch (2 cm) diameter seed with a thin fleshy coating borne on a short peduncle. The mature seed is purple, and is dispersed by birds and monkeys which eat the fleshy coating. It is an important timber tree in eastern Africa, used for building construction, paneling, flooring and furniture. In appearance it closely resembles A. falcatus, which has slightly smaller leaves (mostly 0.8 to 1.2 inches / 2-4 cm long), and slightly smaller (to 0.6 inch / 15 mm long), spherical cones with verrucos (orange-like) skin. Distribution. This species is native to the Afro-montane forests of Ethiopia, Kenya, Tanzania, and Uganda, growing at elevations of 5,800 to 7,700 feet (1,800 - 2,400 m) above sea level with a mean annual precipitation of 45 inches (1,148 mm). Attribution from: Aljos Farjon; A Handbook of the World's Conifers; ©2010, Leiden, Netherlands: Brill Academic Publishers. Longwood Gardens, May 1, 2005 labeled Weeping Podocarpus.